When I was young, I believed that we were all sent to earth for a reason and that we all have significance in the world. 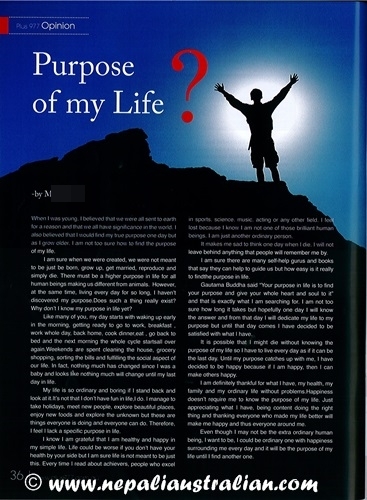 I also believed that I would find my true purpose one day but as I grow older, I am not too sure how to find the purpose of my life. I am sure when we were created, we were not meant to be just be born, grow up, get married, reproduce and simply die. There must be a higher purpose in life for all human beings making us different from animals. However, at the same time, living every day for so long, I haven’t discovered my purpose. Does such a thing really exist? Why don’t I know my purpose in life yet? Like many of you, my day starts with waking up early in the morning, getting ready to go to work, breakfast , work whole day, back home, cook dinner, eat , go back to bed and the next morning the whole cycle starts all over again. Weekends are spent cleaning the house, grocery shopping, sorting the bills and fulfilling the social aspect of our life. In fact, nothing much has changed since I was a baby and looks like nothing much will change until my last day in life. My life is so ordinary and boring if I stand back and look at it. It’s not that I don’t have fun in life, I do. I manage to take holidays, meet new people, explore beautiful places, enjoy new foods and explore the unknown but these are things everyone is doing and everyone can do. Therefore, I feel I lack a specific purpose in life. I know I am grateful that I am healthy and happy in my simple life. Life could be worse if you don’t have your health by your side but I am sure life is not meant to be just this. Every time I read about achievers, people who excel in sports, science, music, acting or any other field, I feel lost because I know I am not one of those brilliant human beings, I am just another ordinary person. It makes me sad to think one day when I die, I will not leave behind anything that people will remember me by. I am sure there are many self-help gurus and books that say they can help to guide us but how easy is it really to find the purpose in life. Gautama Buddha said “Your purpose in life is to find your purpose and give your whole heart and soul to it” and that is exactly what I am searching for. I am not too sure how long it takes but hopefully one day I will know the answer and from that day I will dedicate my life to my purpose but until that day comes I have decided to be satisfied with what I have. It is possible that I might die without knowing the purpose of my life so I have to live every day as if it can be the last day. Until my purpose catches up with me, I have decided to be happy because if I am happy, then I can make others happy. I am definitely thankful for what I have, my health, my family and my ordinary life without problems. Happiness doesn’t require me to know the purpose of my life. Just appreciating what I have, being content doing the right thing and thanking everyone who made my life better will make me happy and thus everyone around me. Even though I may not be the extra ordinary human being, I want to be, I could be ordinary one with happiness surrounding me every day and it will be the purpose of my life until I find another one. 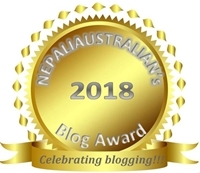 This entry was posted in Published and tagged +977, +977 magazine, +977 Nepalese Australian magazine, a Nepalese Lifestyle Magazine in Australia, Australia, Nepal, Nepali, nepali australian, Nepaliaustralian, plus977. Bookmark the permalink. This is such funny timing as I have been asking myself this same question. What is my purpose? I, too, have wondered about successful people. What drives them and what can drive me? I like your approach of being happy with being ordinary while waiting for your purpose to connect with you. I think that is the best approach I have at this stage as I think I have wasted countless hours already wondering why Ia m not special :). Glad to kn ow that I am not the only one in this boat.